Currently the state of Kentucky now has only six cities that extend legal protections to their LGBT citizens: Covington, Louisville, Lexington, Frankfort, Vicco, and most recently, Morehead. 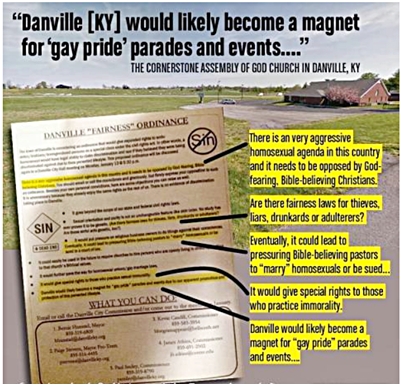 While “Fairness Ordinances” are being debated in other cities around the Commonwealth, the issue has become particularly divisive in Danville, KY with the citizens of city fighting within itself and a certain church The Cornerstone Assembly of God taking an aggressive position against the proposed legislation by including an insert in its Sunday bulletin, listing fifteen extreme and propaganda filled reasons why Danville should not adopt the ordinance. One reason, according to the church, is that there are no fairness ordinances for liars, drunkards, and thieves. and that it would protect the “perverted lifestyle” of homosexual, bisexual and transgendered people. (Cornerstone Assembly of God Pastor Tom) Lane contends that a fairness ordinance has potential consequences that are detrimental for the city of Danville. Lane believes this is all part of a bigger, national agenda for gay rights. Hundreds attended the most recent city commission meeting in Danville. The meeting ended with a decision to hold future workshops to further explore the (issue). Following the workshop, residents filled the public meeting room and an overflow room in the basement to have their voices heard during the city’s regular meeting. As each speaker took to the podium and spoke, “amen” and other sounds of affirmation could be heard from the crowd, many of whom also applauded loudly. Eighteen people, including the self-proclaimed “chaplain to the Kentucky state government” Dr. Lee Watts and Rep. Mike Harmon, spoke before the commission to offer their views on the issue. Of the eighteen, only Centre College Professor Daniel Kirchner spoke in favor of a fairness ordinance. But not all area churches hold the opinion that a fairness ordinance would be detrimental for Danville. Rev. Jim Stewart of the Presbyterian Church of Danville disagrees with much of what Lane’s pamphlet has to say. “This is not necessarily where I would come from or approach it,” said Stewart. “I think it is largely based on fear rather than one of expanding issues of justice to people who are being discriminated against. Stewart does not hold Lane’s opinion that sexual orientation is a changeable feature and a choice. But some people say a flyer making its way across Central Kentucky and social media, has gone too far. It describes the ordinance as a sin opposing Christian-Bible values, and passing it would promote and protect the quote, “perverted lifestyle” of homosexual, bisexual and transgendered people. In response, Commissioner Paige Stevens, who is slated as a mayoral candidate in the upcoming election, disagreed that cost should be the guiding factor.